Palaeontologists for the day – but don’t give up the day job. The weather this morning can only be described as dull, dull and very dull. Oh yes and cold! Whatever happened to spring? Aunty had thebrainwave this morning and suggested we pretend to be palaeontologists and search for dinosaur footprints on Sully Beach. Not quite Jurassic Park, but exotic in its own way. We wrapped up in enough layers to keep warm for anarctic expedition and made our way like the intrepid explorers we are to Bendrick Point. Finding the beach where the footprints are meant to be was easy enough, but then the easy part was over. 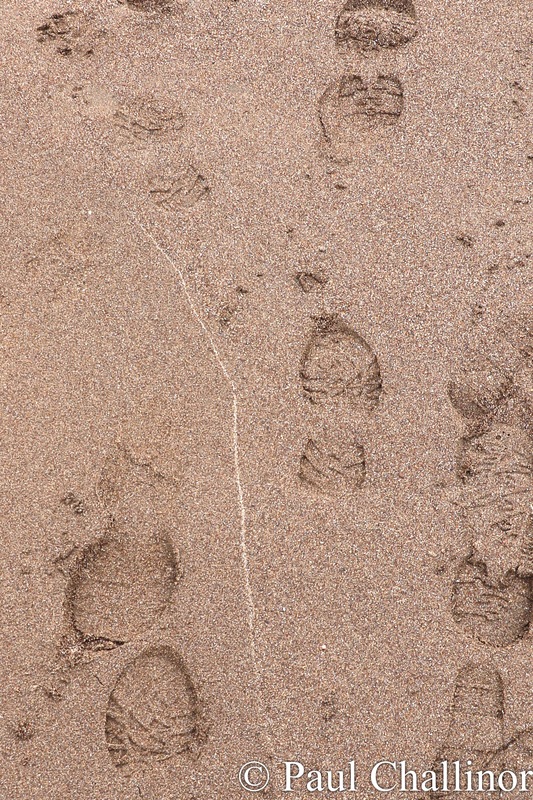 Looking for 220 millions year old foot prints embedded in rock on a beach that is nothing but rock, is, well a challenge. 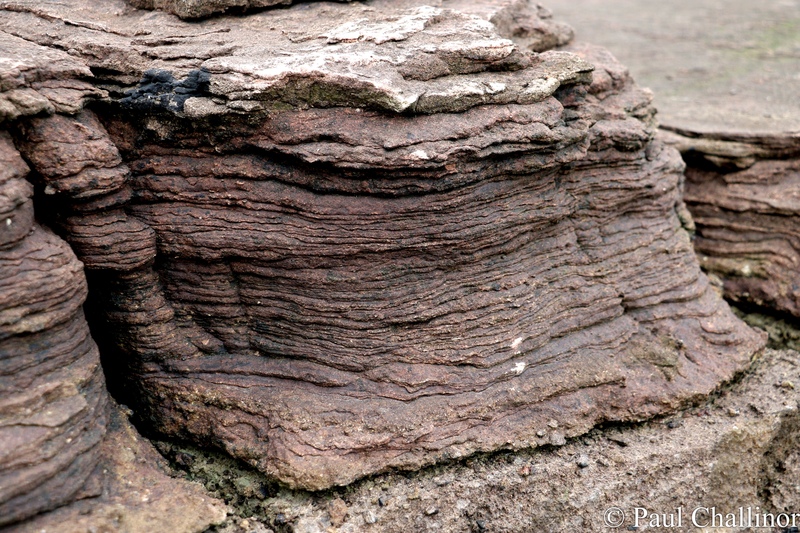 Not quite like looking for a needle in a haystack, but close.. the layers of sand and shale, now rock metamorphosed can be clearly seen. 220 million years ago, in the later part of the Triassic Period, this area lay in the arid belt north of the equator (currently occupied by the Sahara), and South Wales was a hot desert. The Vale of Glamorgan was an area of rocky limestone hills. Although annual rainfall was low, when it did rain, the rain fell in torrents causing flash floods. The floods created rivers which carried boulders, pebbles, sand, silt and mud down to low ground and to a large lake or inland sea which lay where the Severn Estuary is today. “I’m sure these aren’t 220 million years old.” Pipes up Aunty. After about 20 minutes of searching we did find some footprints, but these weren’t the ones we are looking for. Then we started to get our bearings and suddenly we found them. If you look closely it’s possible to see a straight twin line of small puddles in the rock. Look closely and you can see the line of footprints that appear as a line of small puddles in the rock. This track was over 10 feet in length. There are several different sizes and kinds of footprints in the rocks here. Small, three-toed footprints were probably made by small, meat- eating (theropod) dinosaurs which walked on their hind legs. 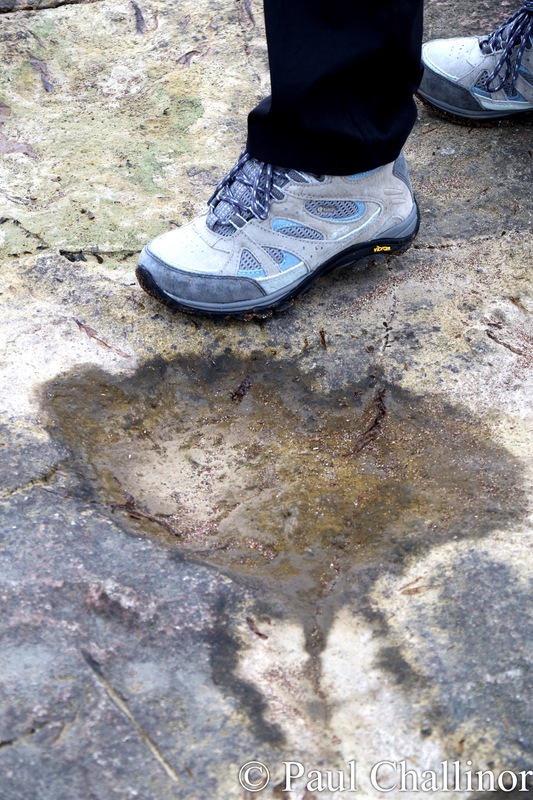 Large three-toed footprints may belong to a larger theropod. Some wider, four- toed footprints may belong to a plant-eating dinosaur which usually walked on all fours. We’re pretty certain this is a footprint, with Aunties size 5s as a comparison. If you squint this could be a three toes foot print. Fascinating, my favourite subject, used to spend all my time when a kid on the island collecting ammonites and gastropods plus bits of the petrified forest, never found a dinosaur footprint though apparently I should have been more observant as there are some on the beach, you two do go on some interesting walks! When Aunty and me, or is it I, visited Paul and your pRents on the Isle of Wight a couple of years ago he took us fossils hunting. I was banging away at the rocks with my hammer. 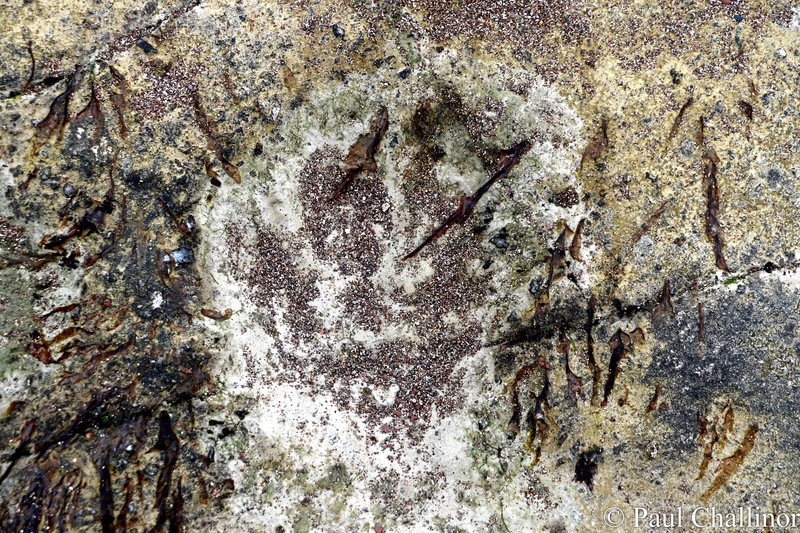 We also saw the dinosaur footprints on the beach there as well. They were a bit bigger than the ones we saw in Sully though.